This week’s UK referendum on EU membership is likely to have both short- and long-term effects on the country’s financial sector. This column, which reports the views of panel members in the monthly Centre for Macroeconomics survey, finds that almost all think that a vote for Brexit would lead to a significant disruption to financial markets and asset prices for several months, putting the Bank of England on high alert. 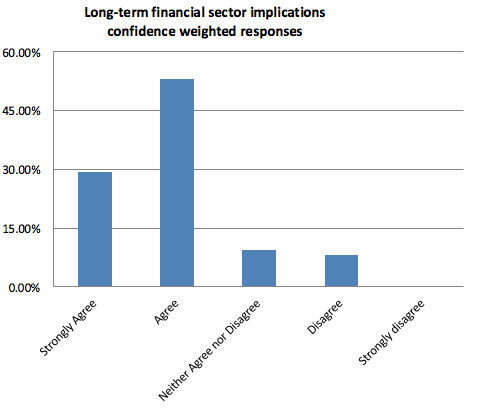 On top of the risk of a financial crisis in the near future, an unusually strong majority agrees that there would be substantial negative long-term consequences. 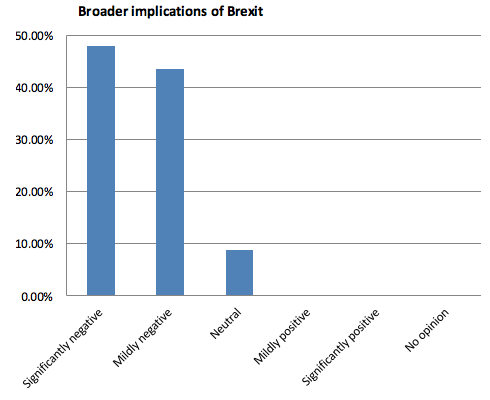 No panel member expects the overall consequences of a Brexit outcome to be beneficial for the UK economy – the first time since this survey began that one side of the argument is supported by none of the respondents. Proponents of Brexit argue that stability of the Eurozone will require greater integration and increased regulation. But changes that are desirable for the financial stability of the Eurozone are not necessarily beneficial for the UK financial sector. One could counter that the UK financial sector is unlikely to avoid being affected by Eurozone financial regulation if it continues to play such a dominant role in Eurozone finance. An objection against this last argument is that given the increasingly global nature of finance, future regulation will be heavily influenced by the G20 and the Financial Stability Board, and the UK has an influential role in these bodies. Finally, it has been argued that the EU-imposed cap on bonuses is not effective at improving financial stability, and that it reduces the competitiveness of UK financial services vis-à-vis non-EU financial service centres. Leaving the EU would allow the UK to revoke this cap. Question 1: Do you agree that there would be substantial negative long-term consequences for the UK financial sector if the UK were to leave the EU? Thirty-eight of the panel answered this question, and a strong majority agree with the statement: 18% strongly agree, 55% agree, 13% neither agree nor disagree, and 11% disagree. When weighted with self-assessed confidence, 82% either strongly agree or agree and only 8% disagree. It is very unusual that the panel members are so united in their views. The two main arguments given by those who agree with the view that Brexit would have negative long-term consequences for the UK financial sector are the following. First, losing privileged access to the Eurozone financial infrastructure is likely to reduce business opportunities for UK-based financial institutions. In particular, several panel members argue that the likely loss of passporting rights will hurt the UK financial sector. Indeed, several participants agree with Morten Ravn (University College London) that the loss of passporting rights will “set in motion a process of relocation” of some (large) banks to the Eurozone. In addition, Jagjit Chadha (NIESR) and Ray Barrell (Brunel) point out that this privileged access enabled UK banks to benefit from ECB’s liquidity operations during the financial crisis and Brexit would make such benefits less likely in the future. 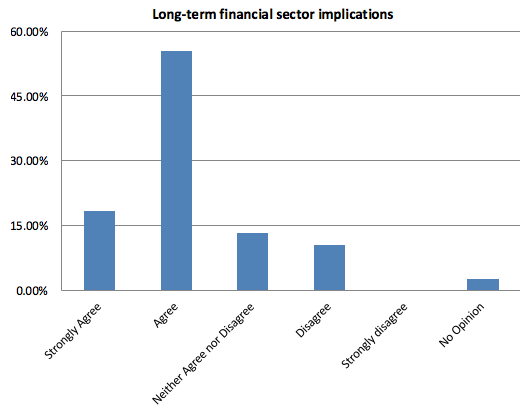 The first question focuses only on long-run consequences for the financial sector. 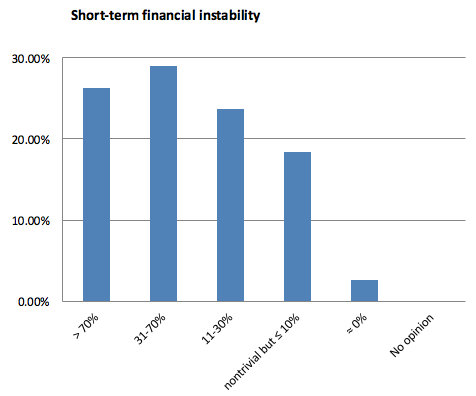 This question focuses on the short-run financial instability that a vote for Brexit would be likely to generate. A vote in favour of Brexit on 23 June would not result in the immediate withdrawal of the UK from the EU. Instead, the UK government would invoke Article 50 of the Lisbon Treaty and have up to two years to withdraw. At the moment of the referendum result, there would be uncertainty about future arrangements with the EU. For example, we would not know about the UK’s future trade relationships with the EU and other countries and they would become subject to negotiation. Similarly, product, labour and financial market regulations would all be subject to some uncertainty. Such economic uncertainty can have a big impact on the investment and hiring decisions of firms (Bloom 2009). Here we focus on the effects of Brexit on financial markets that would be likely to be affected by both the implications of Brexit for UK economic prosperity, as well as by the uncertainty itself. With this question, we want to get an assessment of the likelihood of a severe financial disruption. This question is not about some increased volatility during the weeks immediately following the vote. The type of disruption that we are thinking of is the kind that will make headlines in newspapers for at least several months, will put the Bank of England on high alert, and will be most likely to require some non-trivial intervention by policy-makers. One could counter this alarming prediction with the observation that the UK economy including its financial sector are doing well and that the financial markets may see some advantages in an upcoming Brexit. Thirty-eight panel members answered this question. The results are shocking. The panel members are extremely worried about the consequences of a Brexit outcome for financial markets. 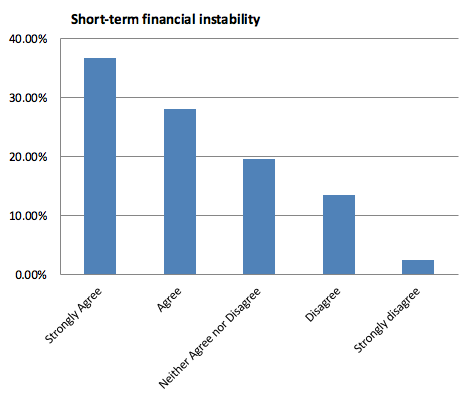 All of the other panel members think that there is at least a non-trivial chance of a serious financial breakdown: 26% think that the chance is higher than 70%, 29% think this probability is between 31% and 70%, 24% think it is between 11% and 30%, and 18% think that it is less than 10%, but still non-trivial. The picture becomes gloomier when answers are weighted with (self-assessed) confidence. Then 37% of the respondents think that the probability is above 70%. One important qualifier is that several panel members point out that it is very difficult to predict how financial markets will react. The first two questions focused exclusively on the financial sector. 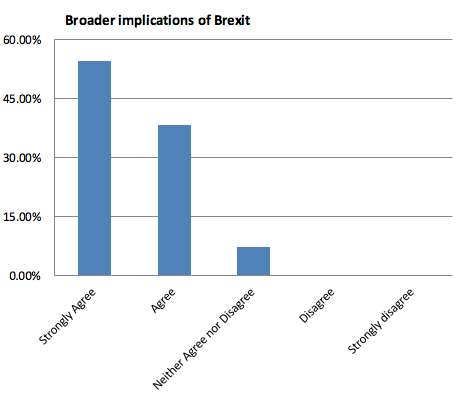 We added a third question to the survey, because some panel members’ opinions may be different when the overall economic consequences of a Brexit outcome are considered and they may want to make that known. Question 3: What do you think will be the overall economic consequences of Brexit for the UK? Twenty-three panel members answered this question and nobody answered that the overall consequences of a Brexit outcome would be beneficial for the UK economy. It is noteworthy that – for the first time since the start of this survey – one side of the argument is supported by none of the panel members. Armstrong, A. (2016) ‘EU Membership, Financial Services and Stability’, National Institute Economic Review May: 31-38. One example is the regulation and oversight of central counterparties (CCPs), which have become a very important part of the financial infrastructure following the global financial crisis. The current arrangement is that the Bank of England and the ECB have joint oversight of CCPs and there are reciprocal currency swaps to facilitate multi-currency liquidity support. This arrangement was the outcome of a long process as the ECB was not initially supportive since the arrangement facilitates a high proportion of euro-denominated financial activities taking place abroad. If the UK were to leave the EU, then the arrangement may not continue, which is likely to have a negative effect on the importance of the UK financial sector for euro-related financial transactions. Passporting rights guarantee the right to sell into the rest of the EU without having a branch there.